Designed and calibrated for small cubic-inch engines such as 305 c.i.d and smaller Chevrolet; 302 c.i.d. and smaller Ford and dual-quad applications such as Edelbrock C-26, F-28 and Street Tunnel Ram. Match with an Edelbrock Performer or Performer EPS manifold and other brands of similar design. Includes both timed and full vacuum ports for ignition advance. Comes with: Metering Jets – Primary .086, Secondary .095; Metering Rods – .065 x .052; Step-Up Spring – orange (5” Hg). Use Carb Studs #8008 or #8024 if needed. 50-state street legal for all 1980 and earlier General Motors V8s (E.O. #D-215-10). Calibrated for maximum fuel economy. Includes timed vacuum ports, EGR and fuel vapor outlet. Not for computer-controlled engines. Comes with the following jets, rods and springs: Metering Jets – Primary .098, Secondary .095; Metering Rods – .073 x .047; Step-Up Spring – orange (5” Hg). Includes carb studs and hardware. Designed and calibrated for optimum street performance in small-block and some big-block engines. Match with a variety of manifolds that include Edelbrock Performer, Performer EPS, Performer RPM, RPM Air-Gap, Torker II and other brands of similar design. Includes both timed and full vacuum ports for ignition advance. Electric choke #1478 can be added if needed. Comes with: Metering Jets – Primary .100, Secondary .095; Metering Rods – .070 x .047; Step-Up Spring – orange (5” Hg). Use our Carb Stud Kits #8008 or #8024 if needed. Designed for small-block and small displacement big-block engines, these carbs are recommended only for stock to Performer level applications. They are not recommended for use on RPM or Torker II intake manifolds. 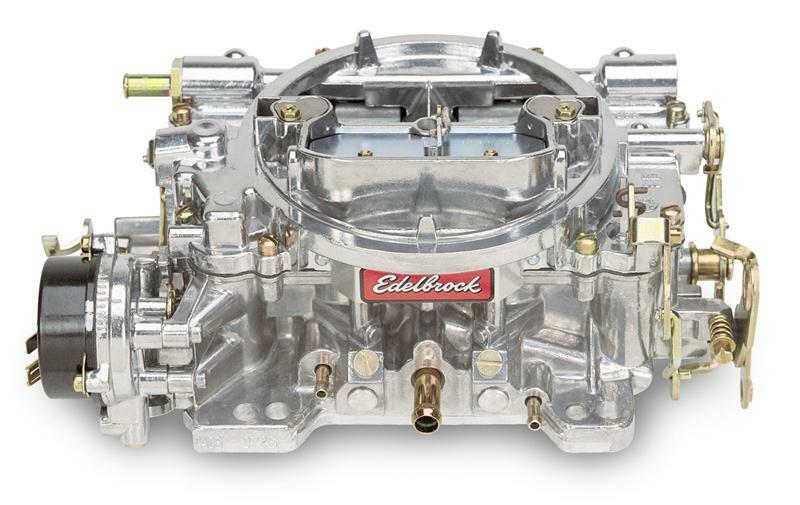 Match with an Edelbrock Performer or Performer EPS manifold and other brands of similar design. Calibrated 2% leaner than #1405. Includes both timed and full vacuum ports for ignition advance. Comes with: Metering Jets – Primary .098, Secondary .095; Metering Rods – .075 x .047; Step-Up Spring – yellow (4” Hg). Use our Carb Stud Kits #8008 or #8024 if needed. Designed and calibrated for optimum street performance in small-block and big-block engines with Performer RPM, RPM Air-Gap and Torker II manifolds and with Performer manifolds on large cubic-inch engines. Includes both timed and full vacuum ports for ignition advance. Electric choke #1478 can be added if needed. Comes with: Metering Jets – Primary .113, Secondary .107; Metering Rods – .071 x .047; Step-Up Spring – orange (5” Hg). Use our Carb Stud Kits #8008 or #8024 if needed. Designed for 402 c.i.d. and larger engines with Edelbrock Performer manifolds and other brands of similar design, these carbs are recommended only for stock to Performer level applications. They are not recommended for use on RPM or Torker II intake manifolds. Calibrated 2% leaner than #1407. Provides excellent fuel economy when used on 454 c.i.d. Chevy and 460 c.i.d. Ford with Performer manifold. Includes both timed and full vacuum ports for ignition advance. Comes with: Metering Jets – Primary .110, Secondary .107; Metering Rods – .075 x .047; Step-Up Spring – orange (5” Hg). Use our Carb Stud Kits #8008 or #8024 if needed. Designed and calibrated for maximum street performance with most Performer RPM, RPM Air-Gap and Torker II manifolds and with Performer manifolds on large cubic-inch engines. Dyno tests proved that the EPS 800 carb outperformed a Holley #3310 carb out-of-the-box by 26 ft/lbs. of torque and 22 hp on a small-block Chevy engine equipped with an Edelbrock Performer RPM power package. Features include a highcapacity accelerator pump and an improved primary and secondary cluster design. EPS 800 has the same superior features as the rest of the Performer Series line such as out-of-the-box performance and 2-piece design. Comes with: Metering Jets – Primary .113, Secondary .101; Metering Rods -.071 x .047; Step-Up Spring – orange (5” Hg). Use our Carb Stud Kits #8008 or #8024 if needed.